Abstract: Modern work on communication aspects of information theory has concentrated on network information theory: the theory of the simultaneous rates of communication from many senders to many receivers in a communication network. Some of the trade-offs of rates between senders and receivers are unexpected, and all have mathematical simplicity. A unifying theory, however, remains to be found out. In the present communication a brief account of classification of cascaded channels is given. Mutual information is defined with utility and proved that it is concave function. The channel capacity of N identical cascaded channels with utility is introduced and studied by applying a general method. Abstract: In this paper, different network penetration testing approaches studied are highlighted with their scope of use and purpose application. Also, these approaches are analyzed to determine their fulfillment to network security ideal criteria and are compared to find the best suited approach. Abstract: The geometry optimization and calculations of harmonic wavenumbers have been carried out using Density Functional Theory with Beckes three hybrid parameters functional (DFT/B3LYP) for a semi-organic nonlinear optical (NLO) crystal L-Lysine monohydrochloride dihydrate (LLMHCl.2H2O). The optimum geometry was determined by minimizing the energy with respect to all parameters without imposing molecular symmetry constraints. Vibrational analysis is done using B3LYP/6-311++G(d) basis sets. Calculated wavenumbers along with potential energy distribution with assignments are reported and compared with experimental IR and Raman data. The natural population analysis was carried out in order to calculate atomic charges on the various atoms of the molecule. The natural bond orbital analysis (NBO) has been performed in order to study the intramolecular bonding, interactions among bonds and delocalization of unpaired electrons. HOMO-LUMO and first hyperpolarizabilities of the molecule have also been calculated and nonlinear behavior of molecule is established using computed data. Abstract: Agroforestry helps in reducing pressure on natural forests and is considered as an important carbon sequestration strategy due to its applicability in extensive agriculture lands. A study was undertaken to estimate Soil Organic Carbon (SOC) stock under different agroforestry models in all the 21 districts of Haryana. The maximum soil organic carbon (SOC) stock was found under bajra (Pennisetum glaucum)  poplar spp. model (35.72 t ha1) followed by rice (Oryza sativa)  poplar spp. (34.06 t ha1), rice  eucalyptus spp. (31.50 t ha1), wheat (Triticum sativum)  poplar spp. (31.08 t ha1), mustard (Brassica juncea)  poplar spp. (29.76 t ha1), rice  shisham (Dalbergia sissoo) (29.22 t ha1) and the least SOC stock was under gram (Cicer arietinum)  Israeli babool (Acacia tortilis) model (6.65 t ha1). Data indicates that SOC stock under wheat Israeli babool, wheat khair (Acacia catechu), wheat  babul (Acacia nilotica) and gram  Israeli babool was low and varied from 6.65 t ha1 to 9.60 t ha1. Organic carbon stock in the soils under haldi (Curcumma longa)  poplar, bajra  shisham and mustard  Israeli babool varied between 17.36 t ha1 and 11.19 t ha1. SOC stock under kapas (Gossypium herbaceum)  Maharukh (Ailanthus excels), wheat  shisham, sugarcane (Sachharum officinarum)  poplar and kapas  shisham varied from 21.68 t ha1 to 25.47 t ha1 while under wheat  eucalyptus, wheat  shisham, rice - shisham, mustard poplar and rice  eucalyptus was relatively higher and varied from 28.31 t ha1 to 31.50 t ha1. The one-way ANOVA revealed that SOC stock under different agroforestry models was significantly different (Variance ratio, F = 15.001; p = < 0.05). The mitigation potential of bajra-poplar and ricepoplar agroforestry models is more than 5 and these models can hold four to five times higher SOC stock as compared to gram-Israeli babool model. 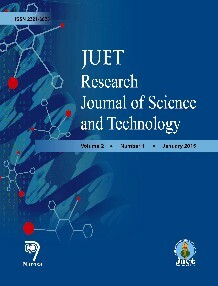 Abstract: Extensive batch and column studies were carried out using pre-treated and pulverized wood rotting macro-fungi Ganoderma applanatum in fixed bed reactors for removal of copper, nickel and zinc from wastewaters under a variety of aqueous conditions, besides studying the engineering properties of the biosorbents for modeling and system design from the chemical engineering point of view. G. applanatum are wildly growing, wood rotting, inedible macro-fungi, abundantly found in Assam, which had never been reported for biosorption applications before the present work being carried out in the Department of Chemical Engineering of Assam Engineering College. Cu (II) was used as the target metal and experiments were conducted to study the impact of other metallic cations like Ni and Zn, and anionic ligands like EDTA, citrate, oxalate and pyrophosphate, found in actual industrial effluents, on the uptake of Cu (II). Optimum process conditions were fixed up and maintained in all experiments for uniformity and compatibility. The uptake of Cu (II) by G. applanatum was found to be about 38 mg/g of dry sorbent, up to bed exhaustion. The presence of Ni (II) and Zn (II) did not significantly affect either uptake or percentage removal of Cu (II). Among the ligands, pyrophosphate did not interfere with Cu (II) uptake, while EDTA completely inhibited sorption. The experimental data were finally fitted into some well-known equilibrium models, which hold the key to the scaling up of such processes from lab to land status. Since biosorption is perceived as a surface phenomenon, involving various physico-chemical mechanisms, the process is not much different from conventional adsorption. Thus most of the adsorption models provide fairly reliable results. The present study applied mathematical models with analytical solutions developed by Thomas and Bohart-Adams to represent the biosorption dynamics of G. applanatum. Abstract: Sustainability of microfinance institutions have always been a topic of debate and discussions in the past. However, in the recent past, the financial performance data of Indian Microfinance sector has shown that the sector is doing well and most of the microfinance institutions are sustainable. But, the Andhra crisis, where many borrowers died due to coercive measures adopted by the microfinance lender, led RBI to start regulating the sector and put a restriction on the interest rate charged from the borrowers. This study compares the operational cost of Microfinance Institutions (MFIs) vis-à-vis the operational margin permitted by the RBI. It also assesses the trend in the markup of MFIs and sees if any policy implication can be drawn. Twenty one MFIs from all over India have been chosen for this study on the basis of clientele of SIDBI and the availability of data. The study reveals that these microfinance institutions are not going to survive if the RBIs restrictions on interest rate cap or margins are implemented. Abstract: The concept of obtaining fuzzy sum of fuzzy colorings problem has a novel application in scheduling theory. The problem of scheduling N jobs on a single machine and obtaining the minimum value of the job completion times is equivalent to finding the fuzzy chromatic sum of the fuzzy graph modeled for this problem. In the present paper the task scheduling problem is solved by using fuzzy graph. Abstract: This paper present a prospective review of various ECG compression techniques using Wavelet transform. Wavelets based techniques offer promising results in signal compression because of its localization, non-stationary property and ability to see signals at different resolutions. A comparative study on compression algorithms based on one-dimensional Wavelet transform has been presented. The techniques are compared based on evaluation parameters like CR and PRD. Also, a modified approach to basic compression algorithm has been proposed to enhance compression results. The proposed algorithm aims to enhance the compression by using mother wavelet matched to the given input ECG signal.